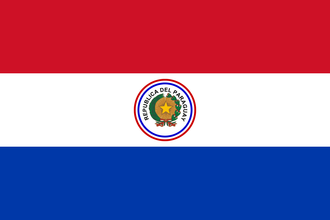 Paraguay is a small country in Central South America. It is bordered by Bolivia to the north, Argentina to the south and Brazil to the west. Its terrain is only forests. In 1936, they were still recovering from the War of the Triple Alliance which had led to the deaths of many of Paraguay's soldiers and civilians. The war had caused an economic depression, which was only worsened by the Chaco War with Bolivia (another poor country) which had ended only half a year earlier. Although Paraguay managed to win this war, the Chaco Boreal region still remained heavily disputed. Despite having a large pro-Nazi/German community and a Axis sympathizing dictator during World War 2, Paraguay would end up joining the Allies against Germany in the closing days of the War in Europe because of aid provided by the United States. Paraguay, lacking a unique national focus tree, uses the generic national focus tree instead. Paraguay starts with 2 research slots. Paraguay, in 1936 is a Communist nation however its elections are every 4 years with the next one being in December 1939. Paraguay is guaranteed by the United States via Monroe Doctrine. Bolivia has a core on Chaco Boreal. Paraguay has 3 civilian factories and 1 military factories in the state of Paraguay. Paraguay's tungsten and steel is in Chaco Boreal. Paraguay has a small military. Their Infantry has 6 infantry units each. Because they are landlocked they do not have a navy. Their starting air force is only 12 prewar fighters strong. Have a good strategy for Paraguay? This page was last edited on 9 December 2018, at 15:17.